Tesla (and FEMA) have garnered most of the press for relief efforts aimed at restoring power to Puerto Rico. Certainly, Tesla and FEMA have been involved in relief action (and inaction), but they are far from the only players in the game. Others have also launched efforts to restore power to the island. Sonnen launched its Puerto Rico Energy Security Initiative (PRESI) with the specific aim to restore power to a number of communities around the island with microgrid technology. 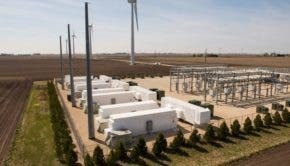 That’s a mouthful, so in layman’s terms — a microgrid is (please don’t assassinate me for my overgeneralization) a power system that is designed to operate as an island with or without a connection to a large electricity grid. Think about it like a solar + battery (+ battery management + charge controller) + (potentially) other renewable energy setup that can keep a home or community online. Sonnen donated 15 microgrid systems and hit the road en route to Puerto Rico to get them up and running. They’re admittedly not going to revolutionize the island-wide issues with the grid in Puerto Rico, but they are significant, noteworthy projects along the road to a sustainable, new energy future for some residents of the island. Sonnen partnered with Pura Energia to install the systems and already has the first system up and running at a church in Loiza. The remainder will be installed over the coming weeks. The initiative was launched out of the sonnen InnovationHub in Atlanta, Georgia, from which sonnen is also shipping numerous units of its residential sonnenBatterie systems in addition to other relief supplies. In addition to these impressive efforts to support the people of Puerto Rico, sonnen is establishing the sonnen Foundation for Energy Security that will focus on developing solutions for individuals and communities in need. With climate change expected to increasingly destabilize weather, adversely affect millions living on coastlines, and drastically increase the intensity and frequency of weather events, the ability to respond to disasters and restore power quickly will become increasingly necessary … so why not do it with clean energy solutions? That seems to be sonnen’s line of thinking, and it makes sense to me. Beyond just its own contributions, the foundation will also accept donations to fund projects and is already accepting contributions to support its efforts in Puerto Rico. For more info on that specifically, shoot an email over to sonnen.